This picture doesn’t mean anything specific. I just made it up. Having said that, it obviously has hidden unconscious meaning. This hat may be a fashion item or a helmet. It may imply that the wearer is a slow thinker, with a snail brain. Slow thinking isn’t necessarily a bad thing by the way – it might mean considered thinking rather than rash impulsive thinking. Maybe you were being rash to jump to the conclusion that slow thinking might be bad! This is a disturbing image, without any specific meaning in mind, but nevertheless very evocative. It could be an environmental illustration symboliseing the destruction of the ecosysten or the environment. 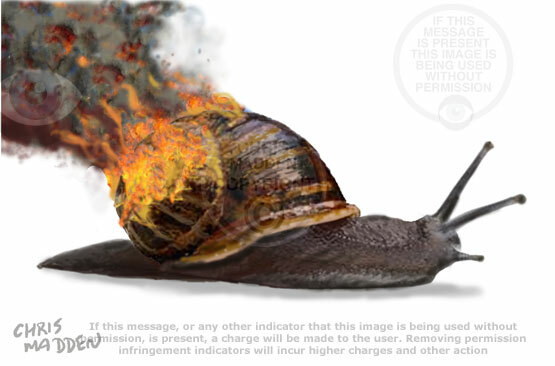 The fact that a snail is a slow creature could symbolise the way that nature cannot run away from the destruction of the environment that is occurring. The image is a digital painting, based quite closely on photos of snails so that it looks realistic (which is important for the impact of the image). The image could be used in environmental campaigns or media articles and reports about the environment. 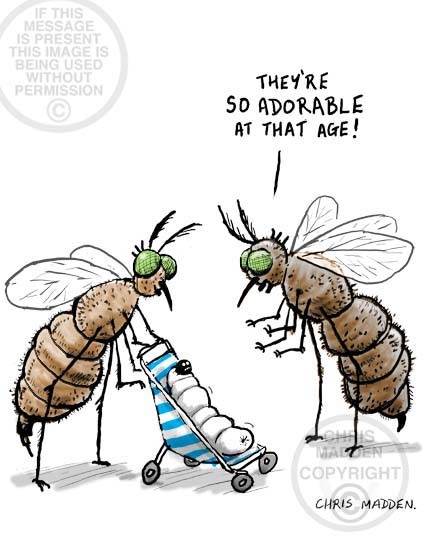 Part of the humour in this cartoon is that the housefly is sitting in such a ‘homely’ setting, and is obviously not an unpleasant creature at all. Notice the pattern on the chair cover – composed of insects (where the human equivalent would show flowers), and the piece of cake, which is going nicely mouldy. This cartoon is in a similar vein to a Gary Larson cartoon from his Far Side cartoon feature. However, the similarity is coincidental, as I’ve been producing cartoons like this since before Gary Larson became established. It’s a sort of zeitgeist thing, where different people working in the same field produce similar work at the same time, because it’s in the air. 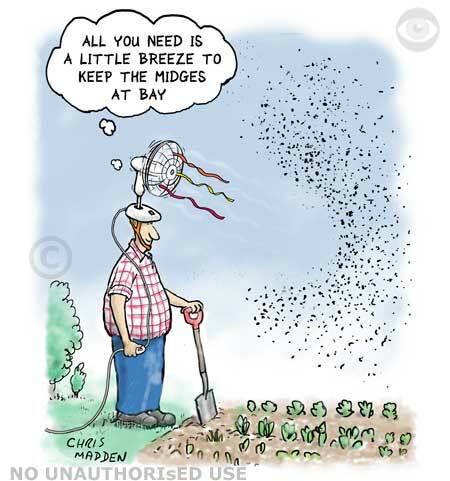 Midges are a pest in the garden and outdoors. They may be small but they go around in swarms and their bites can drive a person to the point of distraction. However, a slight breeze is all it takes to get rid of them. This cartoon shows a method of producing such a breeze. Cartoon about garden insects on flowers. A gardener looking closely at a flower and noticing the tiny insects that are living on it that had been unnoticed until he examined the bloom closely. Cartoon showing a man relaxing at a garden table, but with a column of ants eating his cake on the table. The man is reading a manual titled “How to get rid of ants”. 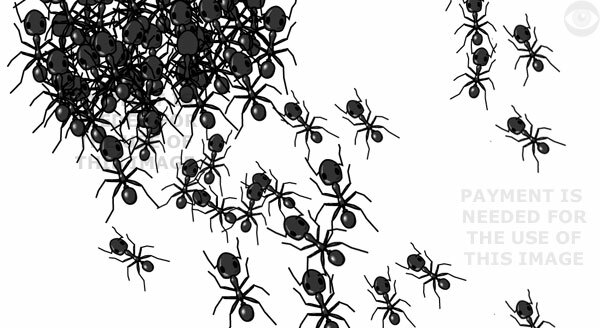 A cartoon about insect pests in gardens, ants attracted to sweet food in a garden. A comic illustration showing a caterpillar or grub (a garden pest) looking at a gardening book or manual about garden pests. The pest shown in the book is a gardener with a canister of pesticide. The cartoon is in the anthropomorphic tradition commonly associated with cartoonists such as Gary Larson. 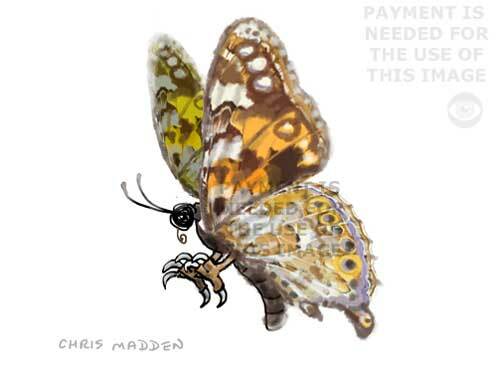 Humorous illustration showing the first butterflies of spring and the first slugs of spring. In the early months of the year gardeners are eagerly on the lookout for the first signs of spring. 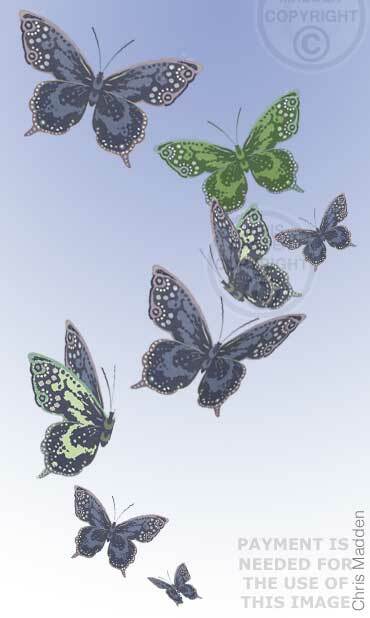 They are pleased to see the first green shoots of spring, the first butterflies and the first swallows of summer. However the changing seasons also bring less welcome visitors such as, as shown in this cartoon, slugs and snails. Children in a garden discovering that slugs don’t have bones. This is a slightly macabre and unsettling cartoon illustrating the way that kids come across information and facts about the world through play, outdoor activities and general curiosity. Some of these activities are in decline now due to the amount of time children spend in front of their computers. Baby insect cartoon. Are maggots cute? An adult insect admiring a baby insect, saying how cute and adorable it is. The baby insect is a maggot. This cartoon is about the way that what we find attractive (or repulsive) is governed by factors of psychology and perception that are dependant on factors within the framework of our existence – such as whether we’re humans or insects. Aesthetic judgement is not an independent quality.